The holiday is in full swing now! The Fitz’s team loves the holidays so much that this year, we are offering professional holiday light installation packages! Everyone loves the look of a lit up home or business during December. It’s one of the best parts of the season… but it can be a hassle and time drain to get the lights out, untangle hundreds of feet of cables, make sure they still work, replace bulbs, find the hooks, run the extension cords, get the ladder, climb the ladder without falling… it’s a pain! Let us do all of it! We will come with new lights, and hook them up perfectly and professionally. It’s totally worth the time and energy to have an insured crew from FFP come take the pain out of the holiday lighting experience. Since we are talking about holiday light installations, here are some tips for your holiday lighting setup that you can consider. When you want to install holiday lights for your home’s exterior, give a little thought to the architectural features of your home that you may want to either highlight or hide. Well, we are talking about chimneys, arches, gables, and more. If you are looking to trace the outline of your home’s exterior with lights, then thinking about those architectural details will come in handy. Although most holiday lights are generally white, many homes across the country are opting for a more colorful presentation. Since Christmas is the key holiday event that everyone is thinking about, you can of course opt for a red and green combination, but do remember that white lights are usually the best for illuminating more brightly than the other colors. If you are looking to make a great impression on your neighbors, simply talk to the Fitz’s lighting team so that we can discuss the most creative color options for your holiday lights. Your front yard’s landscaping is a wonderful canvas for you to deck out with holiday lights. For example, trees, shrubs, and walkways are all great areas to install lighting fixtures so that your curb appeal is enhanced to the max. You can even add a water feature into your landscaping that can be incorporated into your lighting configuration. While most holiday lighting setups are installed on the home exteriors, it is also possible for us to build additional fixtures to make your house stand out. For example, you can consider a tunnel-like structure that is covered fully in beautiful lights which you can use as a temporary carport. 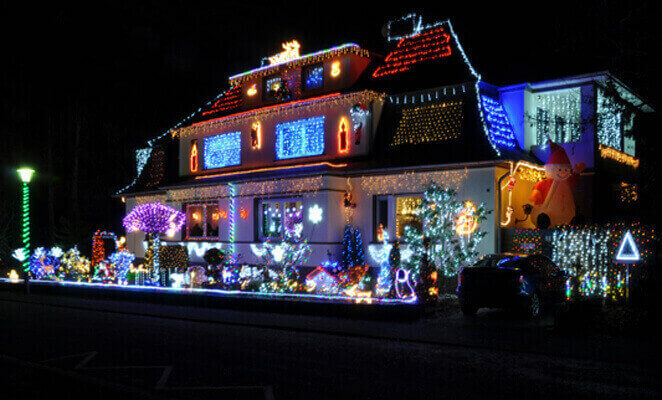 As you can see, holiday light installations are only limited by your own imagination. Choose Fitz’s Lighting Installation Team This Holiday Season! If you don’t have the time or you are not the DIY type of homeowner, getting the help of our Fitz’s team is the best solution to get your holiday lights set up in time, ready to make a big impression. Contact us today to schedule your lighting for this holiday season – call (908) 315-7370 to plan your lighting today!